Event Description Ever wonder how many movies live up to their books? 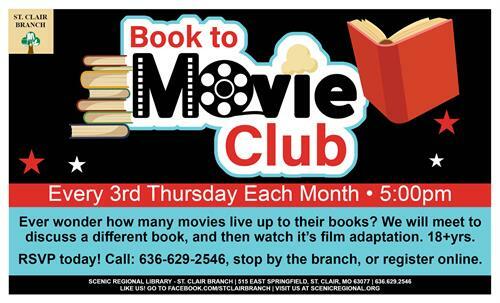 We will meet to discuss a different book, and then watch its film adaptation. 18+ years. RSVP today! Call: 636.629.2546, stop by the branch, or register online. Every 3rd Thursday each month at 5 p.m.